Don’t judge a book by its cover—although great advice to give for both life and novels, it is not necessarily always true for novels. Covers are carefully created for specific reasons and are usually aimed to attract a target audience, and therefor are meant to be judged at some level. As Deirdre Gilbert points out, “A cover may facilitate, distort, or put a new spin on the text it encloses. It may speak for the author, for the publisher, for the designer, or grab all the attention for itself.” The cover of a novel provides a first impression of what literary adventure might unfold for the reader, which is why it must be so carefully picked. Ironically, First Impressions was the original title for Jane Austen’s Pride and Prejudice, and her novel is no exception to the first impressions that covers provide. As literary classics are no longer copyrighted, different publishing companies interested in producing them have the free range to recreate the cover however they please, allowing them to adapt it to appeal to modern audiences. 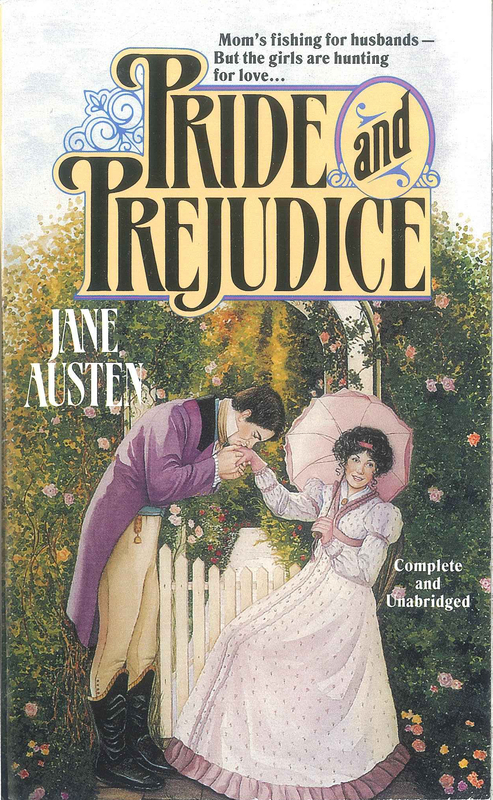 The TOR Publishing, of Tom Doherty Associates, LLC, 1994 publication of Pride and Prejudice is one such cover, with its own unique twist to draw in the reader. 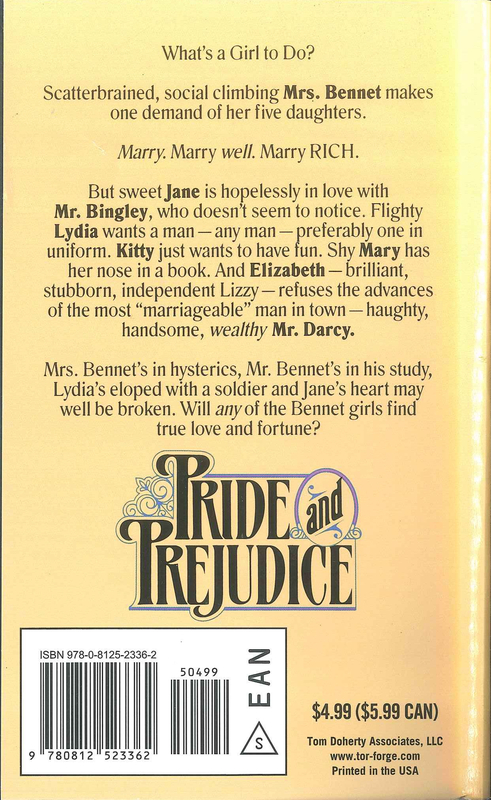 Front cover to 1994 TOR publication of Jane Austen's Pride and Prejudice. The front cover shows a man and a woman, presumably Lizzy and Mr. Darcy, at the white gate and arch of a garden entrance surrounded by high pink rose bushes. Lizzy is sitting in a chair, in white dress, detailed with tiny pink flowers, pink frills around the edges, and pink buttons, and she is accessorized with a pink umbrella, pink gloves, pink headband, and a pink brooch. Mr. Darcy is leaning down to kiss one of Lizzy’s hands, wearing a purple jacket. Both of their attires look completely appropriate for their time period. All of this imagery points towards appealing towards a young romantic reader. The cover art looks like a watercolor, which is a softer medium, delicate in design and color which gives a more amorous tone. The focus of pinks and purples in their clothing also help guides the potential reader to seeing it as a tender content. The background of pink roses also supports this romanticism, not only in color but in the symbolism of roses. Commonly associated with love and romance, roses are the hallmark gift between loved ones, especially for Valentine’s Day, making it hard to see a rose and not think of romantic gestures. Pink roses specifically symbolize gentleness and admiration. Lastly, the most obvious appeal to the romantic reader is the affection between the two main characters: Mr. Darcy who is kissing Lizzy’s hand as she is smiles at the audience, blushing. This provides a little bit of playfulness, directed at the reader to draw them in. Back cover of TOR's Pride and Prejudice publication. The text on the front cover also aids in the romantic tones of the novel. The title of the novel is embellished with some purple outlines, and small, delicate, curvy decorations in blue in odd places. Its ornamental decoration of the text emphasizes the romanticism and the showiness of the front cover. Above it reads “Mom’s fishing for husbands—But the girls are hunting for love…” which hints that the Bennet girls are only focused on finding love and hinting that they are doing it somewhat aggressively, which is not completely true. Of course, all girls at this time are looking for love, but not all the Bennet girls are so assertive with it. The description on the back cover of the novel has a similar feeling, emphasizing parts of Austen’s novel that are important but highlighting them in a way that makes them feel silly and frivolous. The back description is also giving away key parts of the plot that the reader should not know ahead of reading, such as Jane’s broken heart and Lydia’s elopement. This changes the meaning of Austen’s novel, changing the focus of the romance of the novel to feel more frivolous, ignoring the social implications and the pressure that the Bennets are feeling knowing that all of Mr. Bennet’s money will be inherited by their cousin Mr. Collins. This cover takes out a lot of levels of meanings that Austen gives to her characters and their plotlines, modifying the presentation of Austen’s novel. The choice to keep the cover art accurate to the time period Pride and Prejudice is set in, shows the timeless qualities of Austen's novel. The cover, while changing the feeling of the novel, never strays from the plot or the time period. This shows how successful Austen’s novel must be to keep its reappearing in modern bookshelves in new cover art. In part, this is due to the continued romanticism of the late 18th century. Due to widespread association of this time period with authors and novels of love, such as Austen's Pride and Prejudice, modern audiences see men and women dressed from that era as an image of love. One description summary of this edition of Pride and Prejudice starts with, “Tor Classics are affordably-priced editions designed to attract the young reader,” pointing out its two main selling points is its cover and its cheap prices (MacMillan Publishers). As discussed, many of the images and texts of the front and back cover appeal to the young romantic reader. Yet, it is hard to ignore the large, bolded text of the price on the back cover. At $4.99 ($5.99 CAN), TOR sells this novel significantly cheaper than most of its competitors. According to information posted on Mill City Press website, most novels are sold between the $13.95 and $17.95 price range. By selling at a much cheaper price, TOR allows its novels to be more wildly available to its customers. This also might have two additional affects. First, people who were on the fence for buying the novel might just buy it because it is so cheap. Secondly, people might be drawn to this particular publication of Pride and Prejudice not because they are attracted to the cover artwork, but rather the low price of the novel. Nonetheless, it is because of these two characteristics that makes TOR's publication so successful; its romantic tones attracting to a young audience and its cheap prices. Austen, Jane. Pride and Prejudice. TOR, 1994. Persuasions On-Line, vol. 20. no. 1, Winter 2008.